The Cresco Industrial Development Corporation (CIDC) is a not for profit volunteer organization established as a branch of the Cresco Area Chamber of Commerce to promote economic growth. CIDC's primary efforts are to facilitate recruitment and retention of business, assist in local development efforts and to actively promote out community. 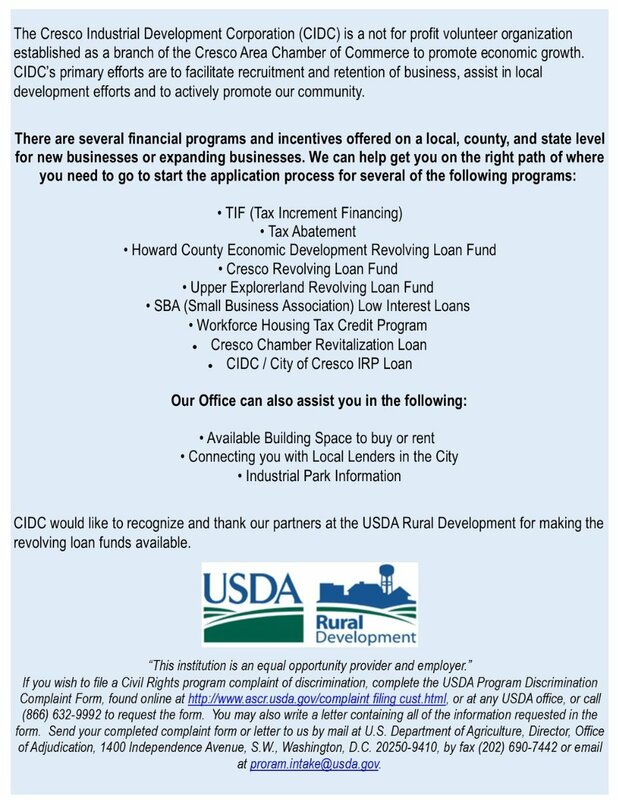 CIDC would like to recognize and thank our partners at the USDA Rural Development for making the revolving loan funds available. If you wish to file a Civil Rights program complaint of discrimination, complete the USDA Program Discrimination Complaint Form, found online at http://www.ascr.usda.gov/complaint_filing_cust.html, or at any USDA office, or call (866) 632-9992 to request the form. You may also write a letter containing all of the information requested in the form. Send your completed complaint form or letter to us by mail at U.S. Department of Agriculture, Director, Office of Adjudication, 1400 Independence Avenue, S.W., Washington, D.C. 20250-9410, by fax (202) 690-7442 or email at proram.intake@usda.gov.